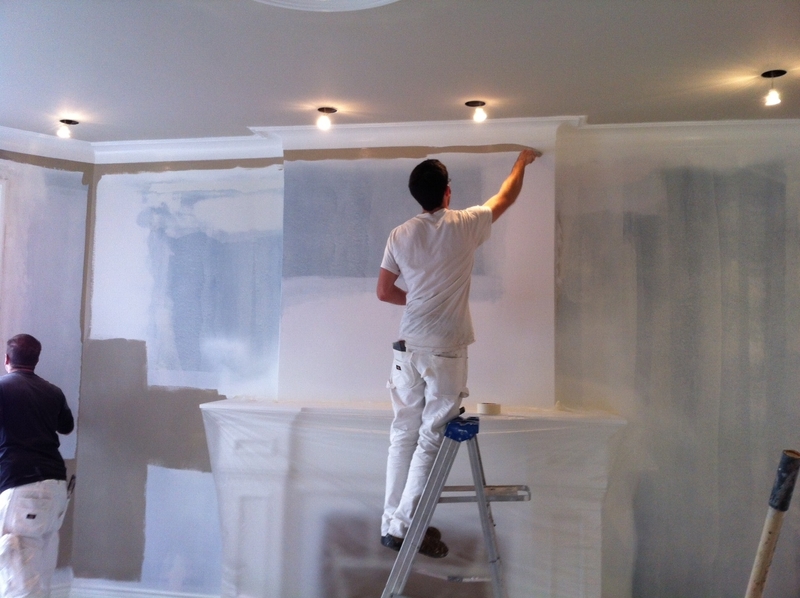 Here are some advices on how to use your paintbrush for an outstanding result on a wall. I always choose to do my edging using an angle shaped paintbrush. This will make it easier to do straight lines, and the brush hairs will be less crooked at the end of the day. Dip the paintbrush into the paint until approximately half of the hairs’ lenght, and do not remove the paint surplus by wiping it on the brim of the can. Wiping the brush does not make sense, because you will have to come back for paint each 2 seconds. Instead of that, hold the brush over the paint (but inside the paint can) and shake it 2 or 3 times by making it rebound on the sides of the can. You will thus have 3 times more paint on your brush, you will be more productive and you won’t make a mess. That’s easy to say, but not so easy to do. First, do not use tape! Second, take your time! The first step when applying paint on a wall (same thing with a roller) is always to get rid of most of the paint by putting it on the wall, but without applying it to close to the edge line. You will work in the finition when your brush is almost empty. Look carefully at your edge line from a 45 degree angle. Do you see the spots where the line is not straight? Stay calm so that your hand won’t shake, and take your time. the more you will try to go fast, and the more time you will waste re-doing it all over again. With practice, you will find your rythm. To obtain more advice on how to paint a surface using a roller, read our article How to manipulate a roller to paint a wall? To require the help of a profesional, contact us now!